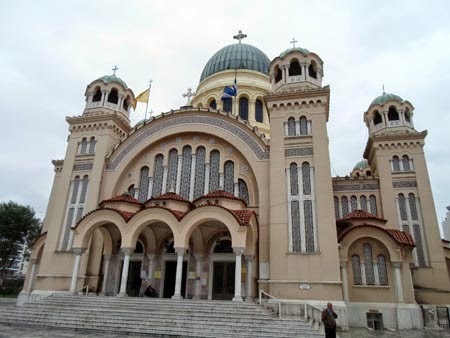 *Tradition holds that St Andrew was martyred upon an X shaped cross in Patras, Greece. Remnants of this cross are preserved within this church to the left of the main sanctuary. *In 1964 the skull of St Andrew was returned to this church from St Peter’s Basilica in Rome, Italy. This relic now rests within a beautiful shrine to the right of the main sanctuary. *Also venerated here are several additional relics of St Andrew including his finger. 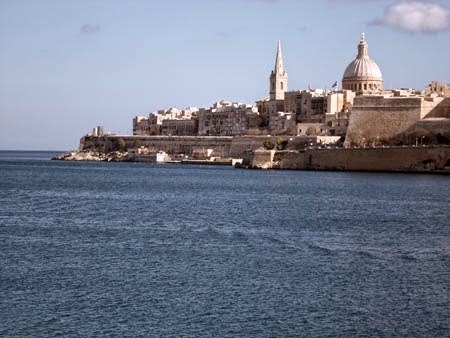 *A tradition holds that this monastery was built directly over the tomb of St Anthony. However, since he had requested to be buried secretly in an unmarked grave this claim is uncertain. *In 1968 Pope Paul VI gave some of the Venetian relics of St Mark to the Coptic Orthodox Patriarch of Alexandria. They are now kept at this church in Cairo. A similar situation happened in 1973 when some relics of St Athanasius were likewise returned to the Coptic Orthodox Patriarch of Alexandria. These relics are also kept at this same church. *This magnificent basilica was completed in 1881 and rests upon a hill overlooking the ruins of the ancient city of Hippo. In 1842 several arm bones of St Augustine, the former bishop of Hippo, were returned to this city. These bones now rest within a glass tube inserted into the arm of a life-size marble statue of the saint. *Tradition claims that the remains of St Barnabas rest within a tomb in this monastery. 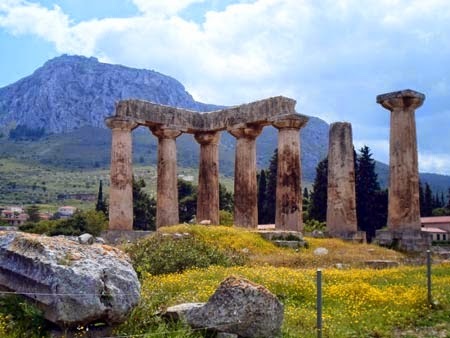 His relics, according to legend, were discovered in 488 AD by the Archbishop of Constantia. According to this legend St Barnabas appeared to the Archbishop in a dream and revealed to him the location of his tomb. Upon opening the tomb a manuscript of St Matthew’s Gospel was found resting upon St Barnabas’ breast. *This monastery is located at the southeastern foot of Mount Athos. *The skull of St Basil the Great rests in this monastery. *This is the oldest continually inhabited Christian monastery in the world. It has never been destroyed and can trace its history back seventeen centuries. Tradition claims that this monastery rests upon the land where God spoke to Moses in the burning bush and at the foot of the mountain where Moses received the Ten Commandments. *As for the relics of St Catherine a tradition claims that a monk at this monastery saw in a vision angels carrying the body of St Catherine to the top of the highest mountain in Sinai. The monks then miraculously found her body as the vision indicated and subsequently buried her body in this monastery. Today these relics rest within a marble reliquary at an altar to the right of the main sanctuary. *In the early 11th century the monk, Symeon Pentaglosses, brought one finger of St Catherine of Alexandria to Rouen, France. A church was built to house this relic. Since that time, however, this French church has been destroyed and the relic lost. *This shrine is built upon the spot where St Charles Lwanga suffered martyrdom. Also preserved here are additional relics from other Ugandan martyrs who lost their lives during this same persecution. *St Cyril of Jerusalem and many other early patriarchs of Jerusalem were buried in a church called the Apostoleion located upon the Mount of Olives. At some point this church was destroyed and the relics lost. Today a French Carmelite Monastery called Eleona rests upon this land. Even though St Cyril’s remains are lost this church is notable for its proximity to his ancient burial site. *The body of St Francis Xavier rests within a casket in the right transept of this church. *On November 27, 2004 a major part of the relics of St Gregory Nazianzen and of St John Chrysostom were returned to the Ecumenical Patriarch of Constantinople by St John Paul II and placed within this church. *The skulls of both St Gregory Nazianzen and St John Chrysostom are said to rest within this monastery. They are preserved within ornate reliquaries. *This tomb was traditionally attributed to St James the Less. However, recent scholarship concludes that is was constructed to honor of a Jewish priestly family from the 2nd century BC. *Formerly this church was called St Mary in Probatica. *Tradition claims that this church rests over the house of Saints Joachim and Anne. Thus it is presumed that the Blessed Virgin Mary was born here. The crypt below this church honors this tradition. Also located just outside of this church is the Pool of Bethesda where Jesus healed a man who had been ill for thirty-eight years. *Historically the tombs of Saints Joachim and Anne have also been thought to rest below this church. However, at present this tradition is not noted in the church. *Located in a remote area eighteen miles south-east of Jerusalem. *St John Damascene, like his father before him, held a high position as a civil-servant in Damascus. However, at some point in the early 8th century he left this to become a monk at Mar Saba Monastery. Upon his death he was buried in this monastery where his remains are said to still be located. *St John of Capistrano played an important in organizing a crusade against the Ottoman Turks at the Battle of Belgrade in 1456. Shortly thereafter he succumbed to a plague and died in this friary. His relics remain here today. 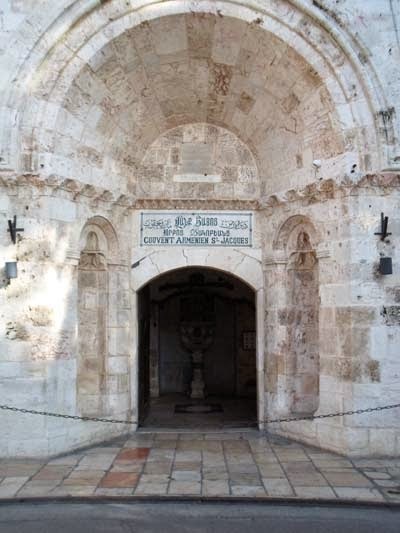 *Relics of St John the Baptist, including his skull, rest within a shrine in this mosque. The authenticity of these relics are uncertain since the skull of St John the Baptist is also said to be located at a number of other places throughout the world including the Cathedral of Amiens in France, San Silvestro in Capite in Rome, Italy, and the Residenz Museum in Munich, Germany. Tradition and Scripture are silent with regard to the death of St Joseph. 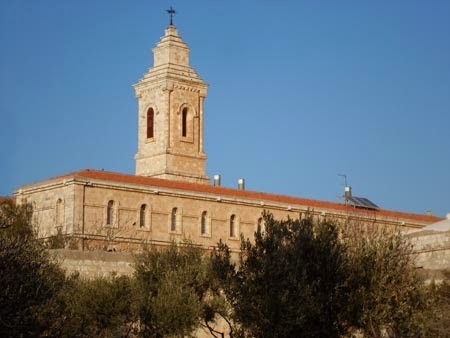 However, a possible location of his burial is a 1st century tomb located in Nazareth beneath the Sisters of Nazareth Convent next door to the Franciscan Casa Nova. *The remains of St Andrew Kim Taegon rest in a cemetery near this shrine. Within this same cemetery are the remains of Bishop Ferréol who ordained St Andrew Kim Taegon as Korea’s first native-born priest. *Some small relics of St Andrew Kim Taegon are preserved here. *Note: Within Seoul the following shrines also honor the Korean martyrs: Myeongdong Cathedral, Seosomun Martyrs’ Shrine, Danggogae Martyrs’ Shrine, Saenamteo Martyrs’ Shrine, and Jeoldusan Martyrs’ Shrine. A 13th century legend claims that Lazarus reached the shores of France and became the first bishop of Marseille. A separate tradition claims that he settled in Cyprus where he became the bishop of modern day Larnaca. *Tradition claims that the tomb of St Lazarus was discovered in this city in the 9th century. Records depict that his remains were later transferred to Constantinople; however, this church in Larnaca continues to claim the possession of his relics. *Jesus raised Lazarus from the dead in the small city of Bethany just east of Jerusalem. During the time of Jesus this city was within walking distance of Jerusalem. However, today because of the large wall separating Israel from the West Bank this walk is impossible. The tomb, nevertheless, can still be visited. It is located in the modern day city of Bethany which has been renamed Eizariya. In Arabic this means Lazarus. St Luke is believed to have died in Thebes, Greece during the latter part of the first century. Records then indicate the transfer of his remains to Constantinople in the fourth century. From here one theory suggests that his remains were transferred to Padua during the Iconoclastic persecutions in the 8th century. Documented proof of their presence in Padua surfaces by the year 1177 when a tomb is unearthed next to Santa Giustina bearing the symbols of St Luke. Papal recognition of these relics followed soon after. *This church is located near an old cemetery south-east of the ancient citadel called the Cadmea. *The original tomb of St Luke rests here. *Recently a rib bone was taken from the body of St Luke in Padua, Italy and given to this church. *A wrist bone of St Paul rests within a reliquary in the right transept of this church. Also to the right of the main sanctuary is part of the pillar to which St Paul was tied when he was martyred. *Nearly all of the remains of the 26 martyrs honored on this day were destroyed after their martyrdom. However, one remaining relic of a bone has survived and rests within this shrine. This bone belongs to Jacob Kisai, a Jesuit lay brother. 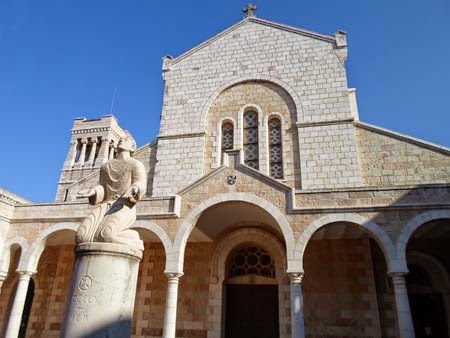 *The museum of this church also holds additional items that are connected to the 26 martyrs. 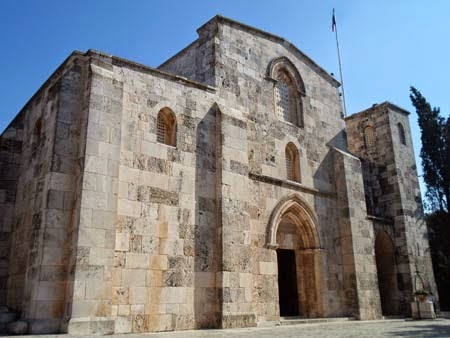 *This ancient church was erected over the original tombs of Saints Perpetua and Felicity. In July of 2011 it was reported that archaeologists had discovered the original tomb of Saint Philip in Hierapolis, Denizli, Turkey. *St Sharbel Makhluf was a Maronite monk who lived the last 23 years of his life in a hermitage near this monastery. His remains now rest within this monastery. St Stephen was martyred in Jerusalem shortly after the death and resurrection of Christ. The earliest tradition places the location of his martyrdom on the northern edge of the Old City where the present Damascus Gate is located. At the time of St Stephen’s death this location would have been just outside of the city walls. The Byzantines later expanded Jerusalem and named the present Damascus Gate after St Stephen to honor the location of his martyrdom. In the 16th century the Ottoman Turks rebuilt the walls and gave this gate its current name. A later tradition places the martyrdom near the Lion’s Gate on the eastern edge of the city. This tradition is commemorated by a small chapel built over a small outcropping of stone at St Stephen’s Orthodox Church. This chapel is accessed by a side entrance along the church’s northern edge. One then descends a flight of stairs to the chapel. Opening hours for this chapel are irregular. The relics of St Stephen, like the location of his martyrdom, have also been tied to various traditions. The tomb of St Stephen is said to have been miraculously discovered in Jerusalem in 415 AD through a special revelation given to a priest named Lucian. St Stephen’s relics were then placed within the now-destroyed Church of Holy Zion which was located in the south-west corner of the city. Then in 439 AD they were translated to a newly constructed Byzantine church just north of Jerusalem’s walls near the Damascus Gate. This Byzantine church was destroyed by the Persians in 614 AD and the relics lost. A new church built over the ruins of this ancient church, called the Basilique de Saint-Étienne, was dedicated in 1900. It honors the memory of Stephen. At some point relics of St Stephen were purportedly transferred westward to Europe. They are now found in many different cities. Among these is Rome where a long-standing tradition holds that a large portion of his remains rest in San Lorenzo fuori le Mura. *As noted above this church honors the memory of St Stephen. *As noted above a chapel just below this church marks a possible location of St Stephen’s martyrdom. A tradition holds that in the 3rd century the bones of St Thomas the Apostle were taken from India and brought to Edessa, Turkey. In 1258 they were transferred to Ortona, Italy. 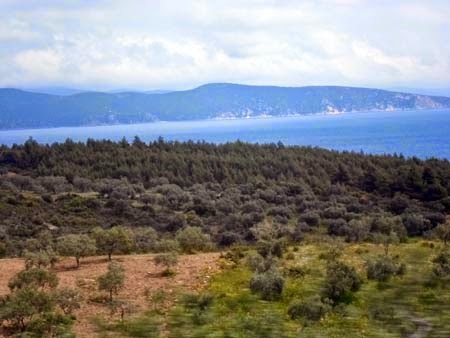 *Tradition holds that St Thomas the Apostle preached in this region and was martyred on St Thomas Mount. *This church is built over the tomb of St Thomas. The tomb is empty; however, a few small relics are within the church. *St Titus is revered as the first bishop of Crete. He is said to have been buried on this island in Cortyna. Later his remains were transferred to Constantinople and his skull to Venice. In 1966 his skull was returned to Crete and placed within this church in Heraklion. *Preserved here are relics from the Vietnamese martyrs including some who were alumni from this college.